We're marking 10 years of Supernatural and commemorating one the most important episodes with our "Swan Song" variant Impala. In conjunction with Greenlight Collectibles, this licensed die-cast car is a replica of the Impala as it appeared on the Rainbow Motors lot, where it was purchased by John Winchester. It features Rainbow Motors dealer plates, the price and year as marked on the windshield in white grease pen and all the dust it gathered while sitting on the used car lot. "The Impala, of course, has all the things other cars have... and a few things they don't. But none of that stuff's important. This is the stuff that's important: the army man that Sam crammed in the ashtray - it's still stuck there. The Legos that Dean shoved into the vents - to this day, heat comes on and they can hear 'em rattle. These are the things that make the car theirs - really theirs. Even when Dean rebuilt her from the ground up, he made sure all these little things stayed, 'cause it's the blemishes that make her beautiful. 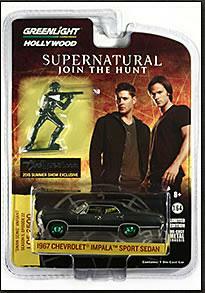 That quote appears on the back of the blister-package that includes the variant 1967 four-door Impala Super Sport and a replica of Sam's Army Man. Limited to 2,000 pieces, this variant is only available through CineQuest.com at San Diego Comic Con 2015. (A limited number will be made available first to members of Club CQ and then to the general public). About 2% of each production run of Greenlight die-cast cars are Green Machine versions, which means they have an area or area painted in Greenlight Emerald Green. The "Swan Song" chase variant has green rims.